Size 15 safety scalpel with retractable, locking shield. Manufactured by Aspen Surgical Products. 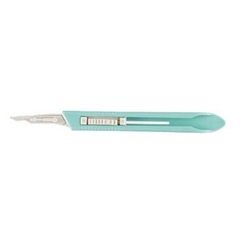 Size 15 safety scalpel with retractable blade. Manufactured by Miltex. 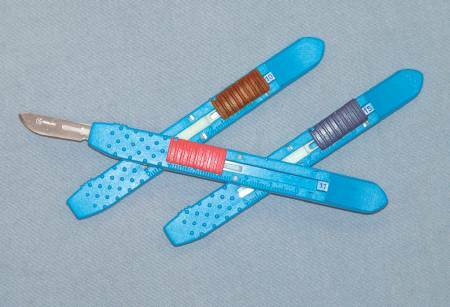 Medi-Pak Performance safety scalpel with retractable blade that has three positions: USE, PASS, and DISPOSE, with steadfast disposal lock. Locks into USE position. Disposal lock status indicator. Manufactured by McKesson.